Lucky timing tonight! Simon was on-site when I passed by after work. This meant I got to have a walk through to see how much had been done! More bricks done, this is around the back of the house, the bathroom window, laundry door and kitchen splashback window. You can see the door to the pantry in the distance through the sliding door. Then the walk through, this is the walk-in robe looking toward the front of the house. Looking from the walk in-robe through the ensuite into the seperate WC. Entryway looking into the great room (apparently that's what you call a living/dining/kitchen combined). The cutout for the slatting hasn't been done yet. Theatre room - speaker cables pulled through, I'm very happy about this! Theatre room "screen" wall with cables pulled through. Theatre room with cavity sliders covered, gives a better idea of the opening now. Laundry initially looked darker than I expected however this is an east facing window in the last hour of the day, and almost half of the glass was covered with the plasterboard! Hall looking from powder room door towards the kids bedrooms, bathroom, linen closet and the garage/airlock. One of the kids bedrooms. One of the kids' built in robes. Kids bathroom not done yet either (nor is ensuite) as it needs blue-board. You can see the bath hob built out and how much light the window lets in even though it's afternoon and this is an east facing window. Some progress made at the front and the rear today by the brickies. Plaster not started yet but I believe due to start tomorrow. Our bricks have been started! They've started the south side - the garage or "low side" of the house. The insulation has also been done, as well as noggings for wall mounting the TV - below is the master bedroom "nook"
And speaker noggings - this is the wall of the theatre that the screen will be projected onto. Lots has happened over the last few days! The plumbing rough-in is done, the roof sheeting has finished being screwed down properly, the electrical rough in is done, the cavity sliders are fitted, it looks like the laundry door and the door between the house and garage are both in, and it also looks like the insulation has been installed in the walls and ceiling. The roof line looks so crisp without the scaffold in the way. There are also temporary downpipes in place. Apparently plastering is starting on Monday. Things are flying along now! I meant to post these last night but have been hit with the flu so went to sleep not long after arriving home. Yesterday the building started getting wrapped. Sarah went past at mid-day also and said it looked like the plumbers were onsite running water to the wet areas. A very productive weekend with my cousin Fletch and my brother Mitch saw the data cabling, speaker cabling and heating/cooling ductwork installed. Zone dampers mounted - the controller for this system can control four zones, we're only using two (a living and a sleeping zone) but we can always add more dampers and re-route ducts down the track if we feel the need to. 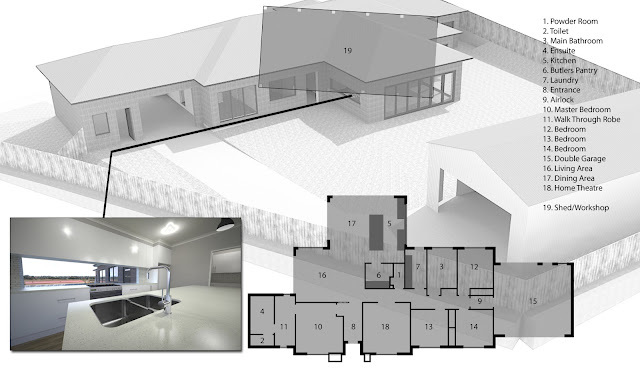 The roof space fills up fast with ducted cooling as the duct is much bigger than used solely for heating. 20 data points ran - we've put 4 each to the TV in the theatre and living rooms, 2 each to the bedrooms, 1 to the fridge, 2 to the kitchen table and 1 to the garage "just in case" - it's much easier to add them now than to do it once the walls are plastered, especially in the theatre room as the walls will have acoustic batts installed. Our House Build - Bricks Onsite! I also took a photo of the roof capping. The services slab has been poured for the air conditioner. Data and speaker cabling ready to be put in over the weekend. 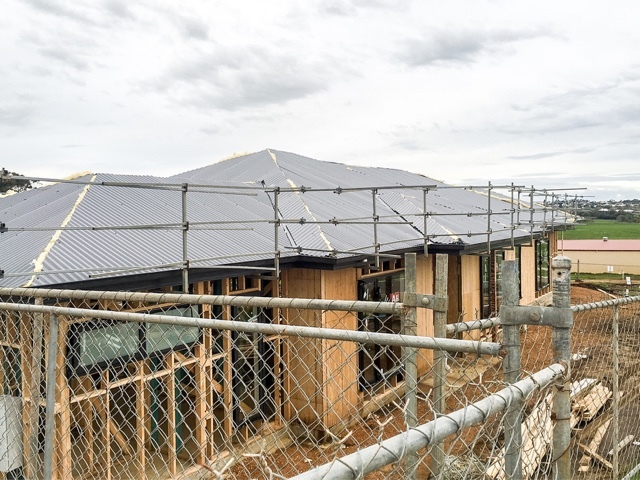 I'm away at the moment but Sarah sent me through these photos of the house, the roof sheeting appears to all be on, which is nice since there's another 25mm of rain forecast today and tomorrow. Hopefully bricks will be onsite soon, I'm not sure when it will get wrapped either. All the rain that we had over the last few days (and that delayed our roof) as well as lots of rain in the surrounding areas to Warrnambool has started to flow its way back to the ocean - bursting the banks of the Merri River and showing why we won't get built out on the road at the bottom of our estate. If they dammed this river the street at the bottom would be a water-side street. I headed to the other side of the river and took some photos looking towards the estate where our house is being built. More progress with the roof sheeting but unfortunately not as much as we'd have liked to see thanks to the rain. 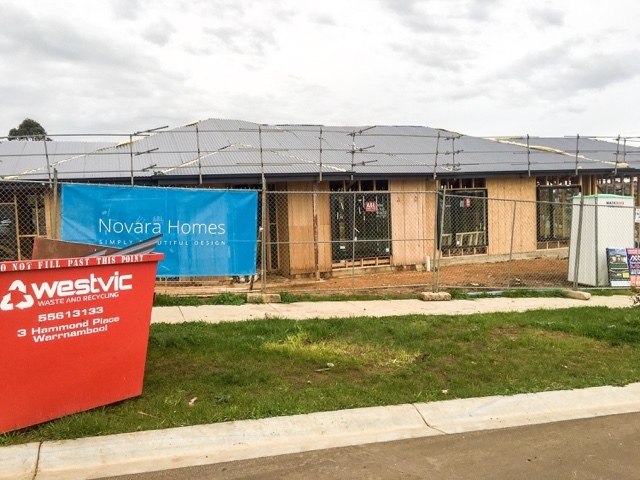 Hopefully early next week the roof sheeting will be finished - we've been given a date for air-con rough in of the 14th (next Wednesday) and I assume it's got to be water-tight for that to be able to proceed. The house is slowly starting to actually resemble a house though, which is nice. I went past the house on the way to work this morning and the team had started the under-roof sarking/insulation. By lunch time there was some colour (colorbond sheeting) on the roof - great to get a feel for the colour. The roof actually looks much bigger with the sheeting than it did without! I spoke to Simon our site manager today and he said they had to pull the pin today as one of the blokes was ill, they're expecting to have 5 people on the job tomorrow though. The scary thing is the forecast for weather from Wunderground is showing 32mm of rain tomorrow! I imagine they want to try and get as much of the house as close to watertight as possible before that rain starts!